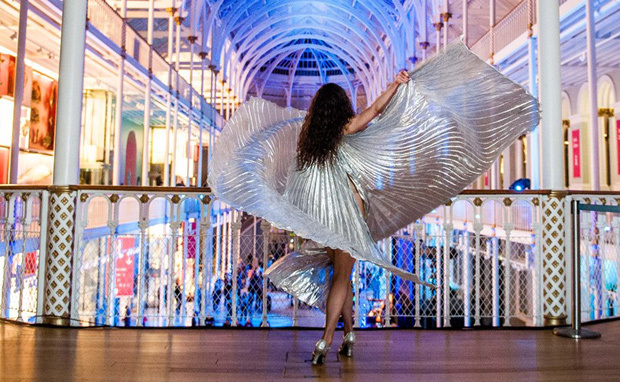 Encounter the National Museum of Scotland (NMS) as never before with some late night entertainment. Especially for the Fringe Festival, the NMS opens its doors ‘after hours’ for adults (18+) to experience the grand opulence of the Grand Gallery while sipping wine, see special exhibitions, live snippets of festival shows and creative events. For three nights during August you can see all this in a not-so-average festival venue. From the main entrance on Chamber Street we found the Brasserie was still open for nibbles, dinner and drinks, a brisk stroll upstairs lead you to the bustling and vibrant Grand Gallery. The Main Stage was slap bang in the middle of the space so standing room was at a premium; visitors lined the balcony above to obtain a better view. Queues for the bars either side of the vast hall added to the congestion, the above average prices for below average fizz, wine and bottled beer failed to deter the thirsty visitors. The word ‘BAR’ was projected across the wall for ease of navigation. If you wanted to explore the other areas of the museum you had to leave the drinks behind, which for me, took some of the shine off the evening. There would have been something deliciously naughty about wandering through atmospherically lit exhibits, whilst sipping on a glass of vino. But it was understandable that they were keen to avoid any drunken Ming vase mishaps! The museum was divided into several performance and activity areas for the night. The aforementioned Main Stage had a varied bill including a trombone quartet, capella singers, comedy tap dancers and a taki maori haka experience – an eclectic mix indeed! Music and chatter echoed around the cavernous Grand Gallery atrium. Old school 50’s Jazz played between acts taking the party people back in time, along with some of the artefacts surrounding us. Over in the Auditorium we were treated to some hypnotic Mongolian grunge and ‘comedy, magic and science’ courtesy of the affable Oliver Meech. The diversity of the acts tied in nicely with the spirit of the museum itself. My personal highlight of the evening was upstairs in the Event Space. Here we could don white gloves and handle ancient Egyptian artefacts, participate in art & crafts and have our photo taken by the wonderfully silly team from Photo Bubble Booth. Hats, horns, moustaches, goggles, masks, and myriad other accessories littered the floor. You were given eight seconds between photos to dress up as daftly as possible and strike a pose – great fun! Plus it was a nice memento to take away from an enjoyable evening.